We are focusing on fundamental problems in advanced technologies in laser applications and energy transport, especially those that interface with emerging areas such as life sciences and nanotechnology. The electrohydrodynamics (EHD) research group at Rutgers University focuses on studying electric-field mediated flow and transport processes within both fluidic devices and bio-electrolytic systems. With a synergistic combination of analytical, computational, and experimental efforts, we aim to explore the exciting interface between engineering and biological sciences, to both advance fundamental understanding and spawn technological innovations. The new Emil Buehler Aerospace Lab, opening in the fall of 2018, is a two-story testing space for drones and aerospace projects. The research of this lab focuses on understanding the mechanisms that govern piezoelectric and dielectric material electro-mechanical and chemical performance and project relating to engineering education. We develop advanced manufacturing, soft materials, flexible electronics, fluid-based centrifugal processing, design, sensors, mechatronics. We work at the interface between Transport Phenomena -Fluid Mechanics- and Statistical Physics -Stochastic Processes- investigating the transport of suspended particles in complex systems. Our objective is to develop a fundamental understanding of transport at small scales by combining theory and numerical simulations with experiments. The goal is to create micro & nanofluidic devices with improved capabilities over conventional systems, in fields such as separation sciences. Retinal detachment is a common and serious medical condition that results in loss of vision and affects upwards of 25,000 people a year in the U.S. alone. The Ocular Mechanics Theory Team at Rutgers develops mechanics based theory and mathematical models of the pathology, as well as of corrective procedures. The retina is a thin, multilayered, tissue that lines the back of the eye on the inside of the globe. The retina spans the posterior of the eye, including the vicinity of the optic nerve, and its purpose is to receive light that the lens has focused, convert the light into neural signals, and send these signals to the brain for visual recognition. Because of the retina's vital role in vision, damage to it can cause permanent blindness. The condition of retinal detachment, where the sensory retina typically detaches from the retinal pigment epithelium, can prevent the retina from receiving or processing light. This prevents the brain from receiving this information, thus leading to blindness. Detachment can be induced by a variety of causes. The theory and models developed by the OM Theory Team, in collaboration with retina surgeons at Rutgers – Robert Wood Johnson, are intended to ascertain a precise understanding and characterization of the mechanisms involved in the pathology under various conditions and, thus, to establish a new paradigm for clinical treatment. 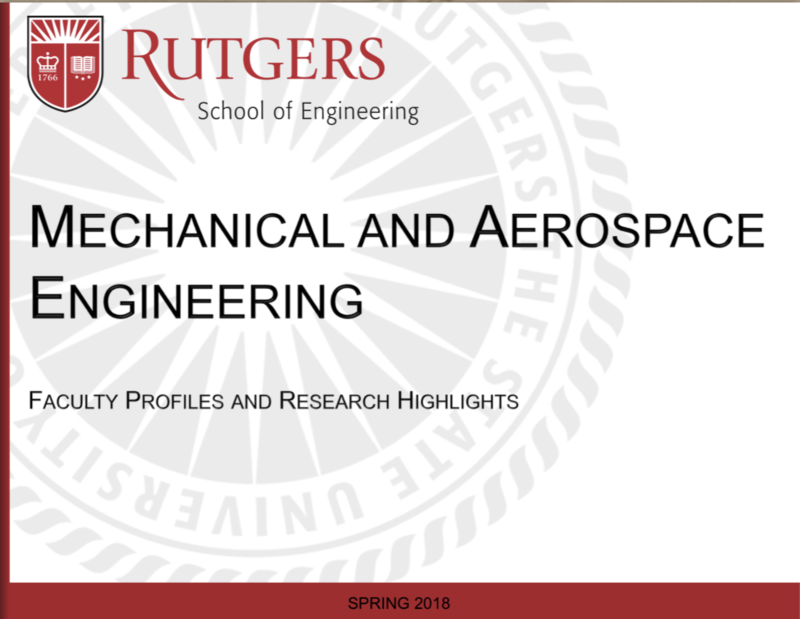 The Rutgers Rapid Automated Prototyping and Integrated Design Laboratory (R2APID) is a 3D Printing Center operated by the Department of Mechanical & Aerospace Engineering. It is available to serve the Rutgers University community as well as commercial entities. Conceptual design, modeling/simulation, optimization, control, manufacturing and testing/validation of smart-material based multi-physics systems. Piezoelectric materials and shape-memory alloys are among the materials that are studied. Applications include aircraft systems such as multi-rotor drones, fixed-wing, flapping-wing and rotary-wing aircraft, energy-conversion and harvesting systems, soft/compliant robotics, manipulators and biomechanical systems, and mobile biomedical devices.